Using Dynamic Yield’s integration with customer segmentation platform VisualDNA, you can sync valuable CRM data segments into Dynamic Yield. 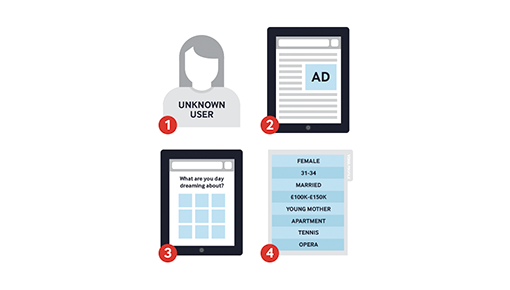 Onboarding these proprietary data segments gives you the ability to personalize the consumer experience during every single interaction. VisualDNA is able to surface customer insights, which Dynamic Yield ingests to give you the ability to target site visitors both efficiently and accurately. Execute more effective acquisition and retention campaigns by integrating CRM data into Dynamic Yield. Personalize every touchpoint and improve every interaction with your customers using this integration. Pull individual and segment-level insights from VisualDNA to generate personalized experiences across channels in Dynamic Yield’s platform. Personalize web experiences and target users that have a high probability to complete a purchase, such as your customers displaying intent to make recurring purchases. Identify known visitors, including returning customers, and welcome them back to your site with a personal greeting. Broaden your segmentation capabilities and create personalized experiences for first time visitors by integrating thousands of segment buckets from Oracle DMP. Onboard your first party customer data from Tealium AudienceStream to obtain the richest view of your customer and achieve real-time personalization at scale. Implement two platforms at once and start personalizing immediately. This joint implementation also powers unique targeting capabilities made possible by mParticle’s data segmentation capabilities. Onboard your proprietary Custora data to target and personalize your customers’ experience through Dynamic Yield’s personalization activation engine.